The OME-DB-8025 screw terminal board (Dimensions:102 L x 114 mm H [4.0 x 4.5"]) has two 20 pin flat cable connectors and blank pads for building – (1) an R/C filter circuit, (2) a voltage divider (for bringing voltage signals higher than that allowed by the A/D data-acquisition board (3) a current to voltage converter circuit. Two 2 m (6.6') OME-CA-2020 20-pin flat cables are included with the board. 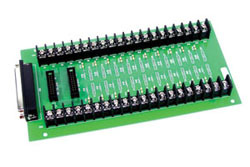 The OME-DB-8025 screw terminal board acts as an analog I/O screw terminal panel to connect to OME-A-812PG or OME-PIO-D64, but can be used for digital I/O with any other OME series boards that have two 20-pin flat connectors for digital I/O. The OME-DB-1825 screw terminal board (Dimensions: 170 L x 114 mm H [6.7 x 4.5"]) has 32 single-ended channels or 16 differential channels. The OME-DB-1825 connects to the D-sub 37-pin connector on OME-PCI-1802, OME-PCI-1602, OME-PCI-1202 or OME-PCI-1002 using the D-sub 37 pin cable (OME-CA-3710 or OME-CA-3720). Other features of the board include blank pads for break detection, low-pass filter, current shunt and voltage attenuation. The OME-DB-1825 screw terminal board also provides an additional D-sub 37-pin connector to connect to OME-DB-889D multiplexer board(s). Please use suffix “/1” or “/2” with the model number to specify the D-sub 37-pin cable length (OME-CA-3710 or OME-CA-3720). The OME-DB-8225 screw terminal board (Dimensions: 170 L x 114 mm H [6.7 x 4.5"]) has 16 single-ended channels or 8 differential channels. The OME-DB-8225 connects to the D-sub 37-pin connector on OME-PCI-1800(H/L), OME-A-826PG, OME-A-822PG or OME-A-8111 using the D-sub 37 pin cable (OME-CA-3710 or OME-CA-3720). Other features of the board include blank pads for break detection, low-pass filter, current shunt and voltage attenuation, and on-board cold junction circuit in analog input channel 1 (jumper selectable single-ended, differential mode). Please use suffix “/1” or “/2” with the model number to specify the D-sub 37-pin cable length (OME-CA-3710 or OME-CA-3720). The OME-DB-8125 screw terminal board (Dimensions: 221 mm x 115mm) has two 20-pin cable connectors and one 37-pin D-sub connector. Two 2 m (6.6') OME-CA-2020 20-pin flat cables are included with the board. The OME-DB-8125 screw terminal board acts as an analog I/O screw terminal panel to connect to OME-A-812PG or OME-PIO-D64, but can be used for digital I/O with any other OME series boards that have two 20-pin flat connectors for digital I/O. The OME-DB-8325 screw terminal board (Dimensions: 220 mm x 114 mm) has D-sub 37-pin connector and connects to OME-PISO-813 using OME-CA-3710 or OME-CA-3720. Please use suffix /1 or /2 with the part number to specify the D-sub 37-pin cable length, m (3.3') or 2 m (6.6') length respectively, (OME-CA-3710 or OME-CA-3720).